1997: Efforts are being made with Rutgers to use the House as an office/research facility. 2004: The City of Bridgeton received a NJHT grant to undertake exterior stabilization and preservation of this property. After stabilization work is completed, the building is to be leased to Rutgers University for use as a marine sciences educational facility. 2008: In September, the Jacques Cousteau National Estuarine Research Reserve opened a satellite facility in the completely- renovated Sheppard House. The center is managed by Rutgers University. Programs delivered at the Sheppard House will provide science-based information to enrich education and advance management of coastal resources. Formal and informal education and training programs will address local and regional concerns for sustainable economic development and conservation of the environment and coastal resources in Cumberland County. The rehabilitation of the Sheppard House is an important step in the City of Bridgeton’s proactive waterfront revitalization efforts. 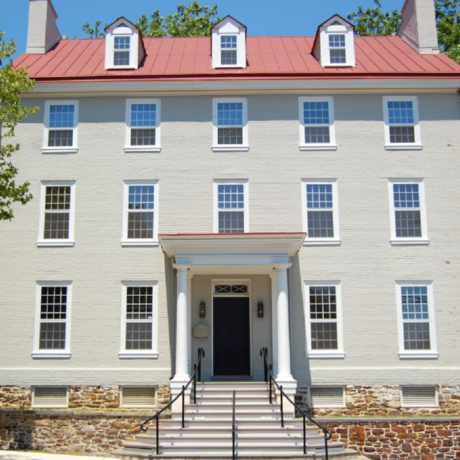 Built in 1791 by David Sheppard (a gentleman farmer descended from early settlers) the building is among the few remaining 18th-century structures in a city whose historic district encompasses several hundred 19th century structures. It was the first house in what would be a fashionable neighborhood until the early 20th century. The main body of the brick Federal-style house is five bays wide and three and a half stories high on a full story base. The house’s imposing proportions, ennobled by a fine classical portico, are its principal facades’ most prominent features. The building apparently grew by accretion over many decades. The interior of the structure is substantially intact. The building housed two generations of the Sheppard family before being expanded and opened as a boarding home for girls in 1860. It was then converted into a nursing home in 1918. Most recently used as a restaurant, the property was vacated in the 1980s. In 1992, the City of Bridgeton seized title to the building for non-payment of taxes. The 19th-century additions to the house were demolished in 1995.